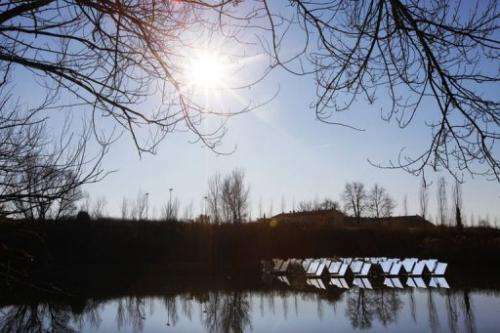 Rays of the winter sun bounce off gleaming mirrors on the tiny lake of Colignola in Italy, where engineers have built a cost-effective prototype for floating, rotating solar panels. "You are standing on a photovoltaic floating plant which tracks the sun, it's the first platform of its kind in the world!" said Marco Rosa-Clot, a professor at Florence University, proudly showing off his new project. Rosa-Clot and his team say they are revolutionising solar power and that their floating flower-petal-like panels soaking up the Tuscan sun have already attracted a lot of interest from international buyers. Standard solar panels on buildings or in fields have been criticised for taking up valuable agricultural land, being unsightly and losing energy through overheating -- issues the floating plants would resolve. The Floating Tracking Cooling Concentrator (FTCC) system is designed to exploit unused areas of artificial reservoirs or disused quarries. While the water keeps the panels at low temperatures, reflectors are positioned to maximise solar capture at different times of day, making it more efficient than a traditional installation, Rosa-Clot said. The head of Scintec, a small family business which produces a variety of renewable energy and industrial devices, Rosa-Clot said the pilot plant set up on the lake near Pisa, Tuscany, was a model of efficiency. "It's a small-scale design, 30 kilowatts, which would suffice for a dozen or so families. The standard is set at 3kW per apartment," he said. 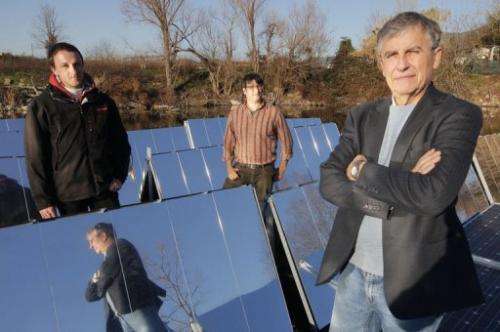 Marco Rosa-Clot (R) and his team members, Paolo Rosa-Clot (C) and Raniero Cazzaniga, stand on a photovoltaic floating plant on the lake of Colignola in Tuscany on January 11. The system is designed to exploit unused areas of artificial reservoirs or disused quarries. At an estimated price of around 1,600 euros per kW including installation, a plant the size of Colignola could cost some 48,000 euros ($63,000). Scintec says its system costs 20 percent less than ground-based structures. The flat panels are winged by reflectors and sit on raft-like structures which are anchored to the lake bed with a pylon. Decked out in jeans and jacket, the engineer explained the benefit that a place like sun-kissed Sicily with its 75 square kilometres (29 square miles) of artificial reservoirs and lakes could draw from the system. "If we covered just 10 percent of that area with floating photovoltaic panels, we would have one gigawatt of power installed," he said -- enough to power 10 million 100-watt light bulbs. Engineer Raniero Cazzaniga, who works on the project, said that some people think classic solar installations are spoiling the landscape. "Our system is designed for low-lying quarries. The installation is only about a metre (three feet) high and usually you can't see it until you get to the water's edge. It is not at all intrusive," he said. Their cost-efficient project has sparked international interest. Rosa-Clot said: "Reactions from abroad have been very positive. Some Koreans came to Pisa to see us and we signed a three-year contract giving them a license to build this sort of installation in South Korea." The Korean company Techwin has built a floating photovoltaic plant using the FTCC technology, and in Italy the Terra Moretti group has installed one on an irrigation reservoir at its winery near Livorno. Rosa-Clot and his team are in talks with "Germans, French and Italian companies" hoping to stay ahead of the curve on water-based solar energy. "There is no miraculous solution to the energy problem," he said. "Our project will make it possible to have a far greater number of photovoltaic installations at an ever lower cost." Great solution. All that fresh water surface space lies unused. Instead of building a 1000Gw central nuclear power plant better build lots of small distributed plants ( solar, wind, thermal, hydro, etc)and never worry about fuel. I am sure some people will find something to protest about this project soon. As long as only a smal percentage of a lake is covered there will probably be no problem. The only potential issue I could find is that it transfers heat into the lake (possibly leading to less oxygen retention or some sort of algal bloom). But that shouldn't be much of a problem since it's only intermittent and and a higher temperature during the day also means a bigger temperature differential during the night (i.e. more rapid cooling) - so the overall temperature shouldn't be affected too much. i wonder how the water plants will like all their sunlight being stolen? Pump hydro storage power plant with solar floating on top - things don't get any better than that. One gigawatt of power is a meaningless figure unless you include exactly when it is available and for how long. Homes don't heat and kettles don't boil on sunlight already gone down for the day. What is the real capacity factor of the installation? That's the most important figure to know, because for solar energy in general it can be as low as 7% of the nameplate figures, like in Germany. These folks are far from the first to do this - Pyron and a few others have already prototyped this for CPV, where the easy tracking is even more important. @Stargazer - good marks for ironic humor, but actually the area needed is quite small. And in areas where hydroelectric production is limited by water (most dams in sunny areas), this also makes great use of underutilized transmission infrastructure.